^ Lang, Brent. ‘How to Train Your Dragon 3’ Release Pushed Back a Year. Variety. 2016-12-05. （原始内容存档于2016-12-06）. ^ 2.0 2.1 2.2 2.3 DreamWorks Animation. New Distributor Twentieth Century Fox Unveils DreamWorks Animation's Release Slate Through 2016 (新闻稿). PR Newswire. 2012-09-09 [2014-10-05]. （原始内容存档于2014-10-06）. ^ 3.0 3.1 3.2 3.3 3.4 3.5 How to Train Your Dragon 3 Pushed Back to 2017. ComingSoon.net. [2014-09-02]. （原始内容存档于2014-11-23）. ^ 4.0 4.1 Film releases. Variety Insight. [2017-06-05]. ^ Show times. Event Cinemas. [2018-12-30]. ^ 6.0 6.1 How to Train Your Dragon: The Hidden World (2019). Box Office Mojo. [2018-12-22]. ^ Alexander, Bryan. Toothless is in love! New trailer, photos from 'How to Train Your Dragon 3'. 2018-06-07 [2018-06-07]. ^ 8.0 8.1 D'Alessandro, Anthony. ‘How To Train Your Dragon: The Hidden World’ To Fly A Week Earlier In February. Deadline Hollywood. 2018-09-27. ^ Gallagher, Brian. How to Train Your Dragon 3 Delayed, Gets New 2019 Release Date. 2016-12-05 [2016-12-05]. 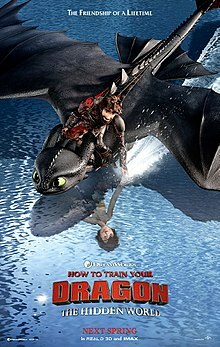 ^ 10.0 10.1 10.2 10.3 'How to Train Your Dragon 3 (2019) News & Info'. Screen Rant. [2017-12-28]. ^ 11.0 11.1 F. Murray Abraham To Get Evil For DreamWorks Animation’s ‘How To Train Your Dragon 3’. Deadline.com. November 2017. ^ 'How to Train Your Dragon 3 Is The Best One Yet, Says Gerard Butler'. Screen Rant. [2018-06-06]. ^ O'Hara, Helen. Katzenberg Talks DreamWorks Sequels. Empire. 2010-12-03 [2011-09-07]. （原始内容存档于2011-05-31）. ^ Giardina, Carolyn. Storyboarding Has Begun on 'How to Train Your Dragon' Sequel. The Hollywood Reporter. 2011-06-02 [2011-09-12]. （原始内容存档于2012-07-03）. ^ Rao, Priya. THIS WEEK IN TORONTO — PART 3. First Weekend Club. 2012-04-05 [2013-10-21]. （原始内容存档于2013-10-21）. ^ Neish, Steven. Author Cressida Cowell Talks How To Train Your Dragon Sequels. Hey U Guys. 2012-08-14 [2012-08-27]. （原始内容存档于2012-08-18）. ^ Chitwood, Adam. Director Dean DeBlois Talks HOW TO TRAIN YOUR DRAGON 3 at VES Awards. Collider. 2015-02-05 [2015-02-05]. （原始内容存档于2015-02-07）. ^ D'Alessandro, Anthony. F. Murray Abraham To Get Evil For DreamWorks Animation's 'How To Train Your Dragon 3'. Deadline. 2017-11-14 [2017-11-14]. （原始内容存档于2017-11-15）. ^ McClintock, Pamela. 'Monsters,' 'Despicable Me 2,' 'Turbo': Summer's Brutal Animation War. The Hollywood Reporter. 2013-06-13 [2013-08-20]. （原始内容存档于2013-08-20）. ^ Upcoming Releases. DreamWorks Animation. [2012-08-21]. （原始内容存档于2012-12-20）. ^ Chitwood, Adam. Dean DeBlois Talks HOW TO TRAIN YOUR DRAGON 3 and Potential Spinoffs; Says He’s Talked Jeffrey Katzenberg Down from the Idea of DRAGON 4. Collider.com. 2014-10-17 [2014-10-23]. （原始内容存档于2014-10-23）. ^ Maas, Jennifer. DreamWorks Animation cuts back to two films a year, delays 'How to Train Your Dragon 3'. Entertainment Weekly. 2015-01-22 [2015-01-22]. （原始内容存档于2015-01-23）. ^ Graser, Marc. Jeffrey Katzenberg on DWA’s Cutbacks: ‘3 Films a Year Was Too Ambitious’. Variety. 2015-01-22 [2015-01-22]. （原始内容存档于2015-01-23）. ^ Schaefer, Sandy. How to Train Your Dragon 3 Takes LEGO Movie 2’s Old Release Date. Screen Rant. 2016-06-19 [2016-12-23]. （原始内容存档于2016-11-08）. ^ D'Alessandro, Anthony. ‘How To Train Your Dragon 3’ Flies To 2019; Uni’s DWA To Scale ‘Everest’. Deadline. 2016-12-05 [2016-12-23]. （原始内容存档于2016-12-22）. ^ Lang, Brent. How To Train Your Dragon 3: Title Announced. Variety. 2018-04-17. ^ White, James. How To Train Your Dragon 3 Is The Hidden World. Empire. [2018-04-18]. ^ DreamWorks Animation [@DWAnimation]. In ONE WEEK, see the trailer for How to Train Your Dragon: The Hidden World. #HowToTrainYourDragon (推文). 2018-05-31 [2018-06-06] –通过Twitter. ^ DreamworksTV. HOW TO TRAIN YOUR DRAGON: THE HIDDEN WORLD Official Trailer. 2018-06-07 [2018-06-07] –通过YouTube. ^ DreamworksTV. HOW TO TRAIN YOUR DRAGON: THE HIDDEN WORLD Official Trailer 2. 2018-10-25 [2019-01-06] –通过YouTube. ^ How to Train Your Dragon: The Hidden World (2019). Rotten Tomatoes. [2019-01-04]. ^ How to Train Your Dragon: The Hidden World reviews. Metacritic. [2019-01-03].